BRUSSELS, BELGIUM--(Marketwired - Dec 9, 2013) - Traveling to Brussels practically guarantees visitors a brush with the unusual. From majestic architecture to trendy gastronomy, historical sites to chocolate shops, Belgium's capital city is one of those places that just gets better with every visit. But when a guest stays at the Renaissance Brussels Hotel, the RLife program ensures that the experience is memorable in the most multidimensional of ways. Designed to give visitors an insider's look at any given city, the Renaissance Hotels' global RLife program involves a range of opportunities to go beyond the tourist spots. These include RLife LIVE events, highlighting emerging talent in the arts, and R-Navigators, expertly connected navigators who recommend hotspots only locals know about. RLife experiences range from culinary adventures to energetic happy hours, but the unifying theme is one of cultural discovery. In Brussels, such discovery is an exciting prospect, especially considering the energy within this hotel located near Brussels' biggest landmark, the Grand Place. Vibrant colors, dramatic architecture and one of the trendiest bars in Brussels translate to an environment where locals and visitors want to be. Case in point is the monthly RLife LIVE event the hotel hosted in November 2013, which brought together Belgium's renowned DJ PSAR and the up-and-coming violinist Renato Marquez to perform for a few hours. The event was complimentary and musically groundbreaking. 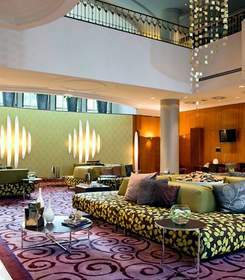 With happenings like these planned each month, the hotel is poised to solidify its reputation as one of the finest event venues in Brussels. Not only does its ballroom accommodate up to 360 guests at one time and offer dedicated event planning, but its restaurant, Parnasse Bistro, that is one of the city's most highly sought restaurants, thanks to its seasonal menu of beloved Belgian dishes. Whether guests on vacation drop in for a sophisticated happy hour at The Schengen Bar, or make time in between meetings to attend a monthly RLife event or weekly live life to discover lounge activation this EU District hotel, they will not be disappointed. Travelers seeking contemporary comfort and a central location from their hotel will find everything they desire in the Renaissance Brussels Hotel. The property is located just steps from the chic boutiques of Avenue Louise and within the European Quarter, and its amenities live up to the neighborhood's reputation. A state-of-the-art fitness center encompasses a heated indoor pool, sauna, fitness classes and personal training. So many opportunities to stay active make it easy to then indulge in the hotel's two culinary options. Parnasse Bistro whips up seasonal dishes with local ingredients and pairs them with stellar wines, while the trendy Schengen Bar welcomes visitors and locals looking for a light meal or an evening drink. The 238 guest rooms and 24 suites feature flat-screen televisions, high-speed Internet, 24-hour room service and plush bedding for the perfect respite at the end of the day, while the exclusive Club Level entices guests with its lounge and upgraded amenities. Plus with 9 meeting rooms (6,824 square feet of space), the hotel is ready to welcome corporate travelers as easily as it does vacationers. When a guest stays at the Renaissance Brussels Hotel, the RLife program ensures that the experience is memorable in the most multidimensional of ways. Vibrant colors, dramatic architecture and one of the trendiest bars in Brussels translate to an environment where locals and visitors want to be. The monthly RLife LIVE event the Renaissance Brussels Hotel hosted in November 2013 brought together Belgium's renowned DJ PSAR and the up-and-coming violinist Renato Marquez to perform for a few hours. The event was complimentary and musically groundbreaking.